This is the newest incarnation of the Cygnar gun mage Allister Caine, who now leads the remnants of the Black 13th Strike Force gun mage unit following the events of the Skull Island eXpeditions novel Mark of Caine. Caine is back and ready to take up the fight once more leading the remaining two members of the famed Black 13th. 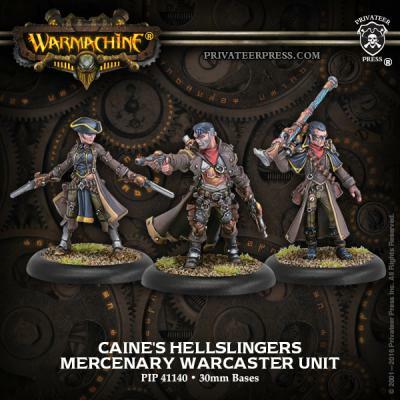 Though he now battles to further his own agenda, Caine's Hellslingers boast the Partisan [Cygnar] ability, which allows them to bring their formidable skills to both Mercenary and Cygnar armies. The Hellslingers bring death and destruction to their enemies in a whirlwind of magelock fire. Thanks to Caine's new attack type, Witch Mark, enemies hit by his pistols become easy prey for his spells, such as Calamity.